This page last changed on Feb 04, 2005 by sbannasch. Remember: this activity is for 8-10 year olds. There are two main components: a Sound Grapher and a Sound Player. This document describe the Java version which runs on desktop operating system. There will be an addeendum which describes a similar functionality for handheld platforms. there is one button control of data collection – when not collecting the button is labeled "Start", when collection and display are active the button is labeled "Stop". This button can be controlled by a mouse click, the spacebar or the Return key. when Stop is pressed the current graph is saved and frozen. trigger condition is met by a positive going signal that crosses a value which is 60% of the maximum amplitude for the last 10 ms. The values of 60% and 10 ms should be adjusted programmatically to acheivbe the most stable waveform display in varying complexity of waves and at different levels of amplitude. if trigger condition is not met within 20 ms then the data is graphed without waiting for a trigger condition. Microphone datasource. automatically chooses the built-in microphone and speaker. Only the data collected AND displayed in the graph windows is available for saving. That means that if we are using 30ms windows only the 30ms of data in that window need to be saved. The earlier data that was displayed while collecting is not saved. Save button ? saves currently active (stopped) screen. Name it when you save it. Must be available for automatic display later in the activity. Hide amplifier slider. They could be in a drop-down menu. A separate CCPortfolio component that is a button to play a pre-recorded sound. When you play it, it will be heard and viewed in the Sound Grapher. It could be 4-10 seconds long. Must user check for volume setting on computer, because we don?t know what the settings will be?? Not good. 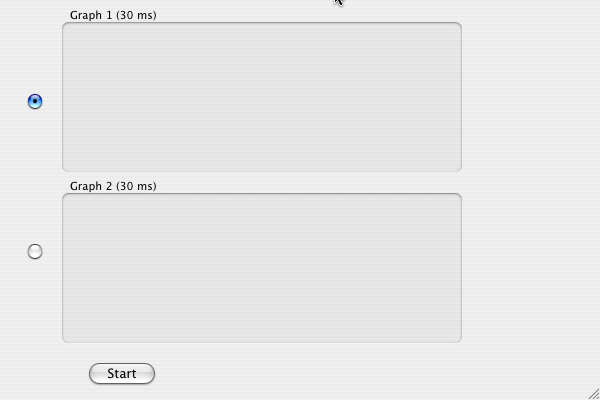 Can select the one-second display on one screen and the 30 ms display on the other. Lower display is always 30 ms, upper display can be either. Link the two so that a selected 30 ms slice of the 1-second display can be shown in the other display. Zoom, resize ? make this adjustment unnecessary for younger grades. Put in a drop-down menu. Display a sound pattern on the grapher, then play (be able to hear) the sound.